Play n Go have announced a new deep sea slot called Sea Hunter. 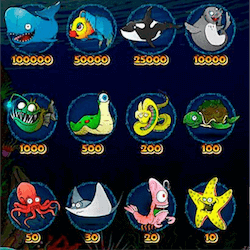 While most underwater themed slots will see you hanging out and making friends with a collection of cute creatures, Sea Hunter takes the opposite approach. By using a pair of reel modifying cannons on each side of the reels, you must shoot a colourful collection of water wildlife to unlock their cash prizes. The graphics find a great middle ground between amusing looking characters and a very cool Victorian steampunk aesthetic. The pumping soundtrack is the perfect accompaniment to the fast paced gameplay. With the slot’s sleek, 3×3 reel layout, it is designed to be played fast and furiously. There are only 5 paylines to activate so you can start playing this game with a low budget, but since you can adjust the coin values up to 100, high rollers should also find a lot to be excited about in Sea Hunter. Sea Hunter has been announced shortly after the big release of Hugo 2. With the success of the first Hugo slot, Hugo 2 certainly drew a lot of attention and buzz which may rain on Sea Hunter’s parade a bit, but with these great graphics and the fast game play optimised for mobile action, it should still be able to stand on its own as a solid slot. Play n Go have also been courting the Asian market with their release of Fu Er Dai and Big Win Cat last month but Sea Hunter should have cross country appeal. While other developers are taking advantage of the holiday season to start revealing Christmas themed slots, it’s great to see Play n Go deliver something original in December. When it comes to bonus features, the laser guns on each side of the reels are the main elements. They can add 4 different effects on the reels, the catch being that they get powered up by winning combinations. The more you win the stronger they get and the better the effects they can add. The cannons have 4 levels they can power up to, but a non winning spin will power them down again, so the best strategy is to attempt to land as many consecutive wins as possible. The effects that can be added to your reels include the Sticky Shot which can turn all matching symbols on the reels into wilds which remain in place for a re-spin. There is also the Multiply Mortar which can add an up to 15x multiplier to any winning combination. Sea Hunter should be going live at Play n Go casinos in the next two weeks.